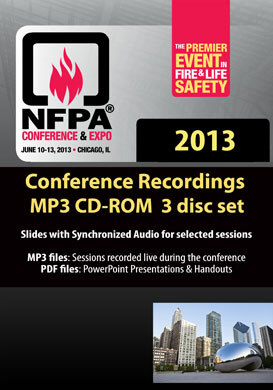 Take the conference home with the Complete NFPA 2013 Conference Package on CD-ROM ! This interactive multimedia CD-ROM features All sessions live audio as MP3 files! Plus 32 sessions were captured as video of the slides with synchronized audio! You can listen to the presenter audio, exactly as is happened live on your computer, iPod or MP3 player. This package allows you to review presentation materials and is a lasting valuable resource. Plus this package includes the PowerPoint slide presentations. 21289 M42 Community Risk Reduction – A Positive Experience in the U.S.
21322 T28 NFPA 25, 2014 Edition: What Is New and Different? 21351 T63 Reduced Ignition Propensity Cigarettes: Is There Difference in Smoldering Ignition Hazard? 21356 T68 Fundamentals of Combustible Dusts, Where Are They Now? 21363 W03 Hazard Analysis — What Does It Mean for Combustible Dust Applications? 21365 W05 Bullets, Gun Powder, and Primers! What Really Happens to Small Arms Ammunition in a Fire? 21396 W44 What Is the Latest From UL On Gasoline/Ethanol Blends?